Unlike many vendors in the small wind business. We use real wind buck boost MPPT technology to make more power over time than any leading wind turbine manufacturer for the money. We have listed this turbine by itself as some of the consumer are doing direct grid tie applications with lower voltage start-ups for which buying the turbine without it's controller is appropriate. As always if you have questions see our technical support line for questions or contact us through eBay messages if you do not know if the product is right for you. Greeting folks Tony from Hurricane Wind Power here. Let me start out by saying we have put a lot of work into our new wind turbines. We have some of the best pound for pound machines in small wind period! The 24 Volt Hurricane XP is our professional grade wind turbine that is as easy to mount and use so that the beginner can achieve impressive results in power production that even those experienced in wind power will be envious of. The Hurricane XP 24 volt residential wind turbine is perfect for both home on and off grid use. Do not be fooled by those that make ridiculous claims regarding power production. 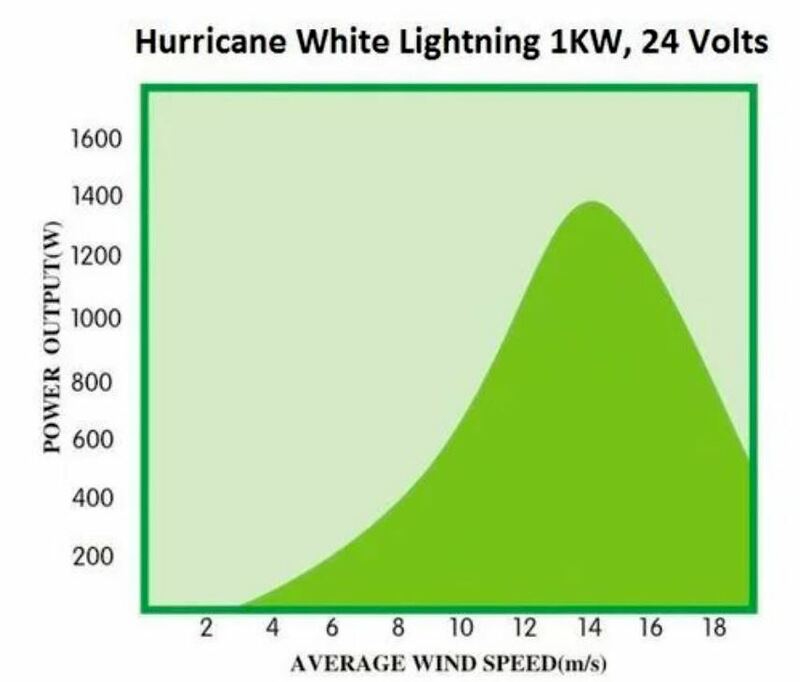 The Hurricane XP will exceed the power output of wind turbine from other companies with wind turbines rated up to and exceeding to 2kw and more. CE listed laboratory rating for piece of mind knowing this is not just another cheap kit thrown together by some guy in his garage. Reinforced nylon glass-fiber using advanced thermoplastic engineering and precision injection molding technology for higher strength, flexibility and reliability .Cp.>0.32 at low wind. and vibration are caused by turbine blades rotation in the wind and generator resonating with the rotor and tower, and generator bearings Hurricane stealth blades are well designed and work quietly in both low and high wind. Adopt industrial grade components, to ensure every electric parts performance can meet with harsh environments. Click the button below to add the Hurricane XP 24 Volt Wind Turbine Generator Kit 1000 Watt , Max 1500 Watts to your wish list.